View from above Ralph Bunche Park. 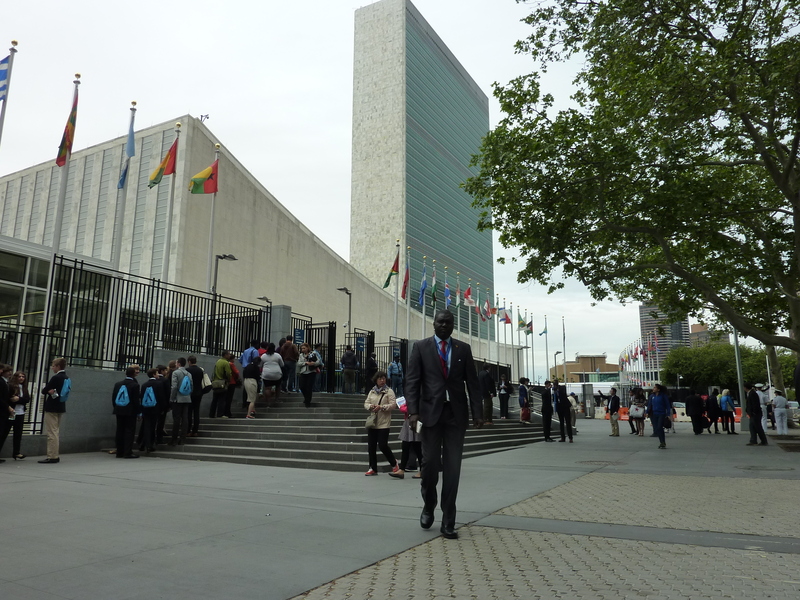 It was a beautiful week in New York City for my visit to the UN Archives. 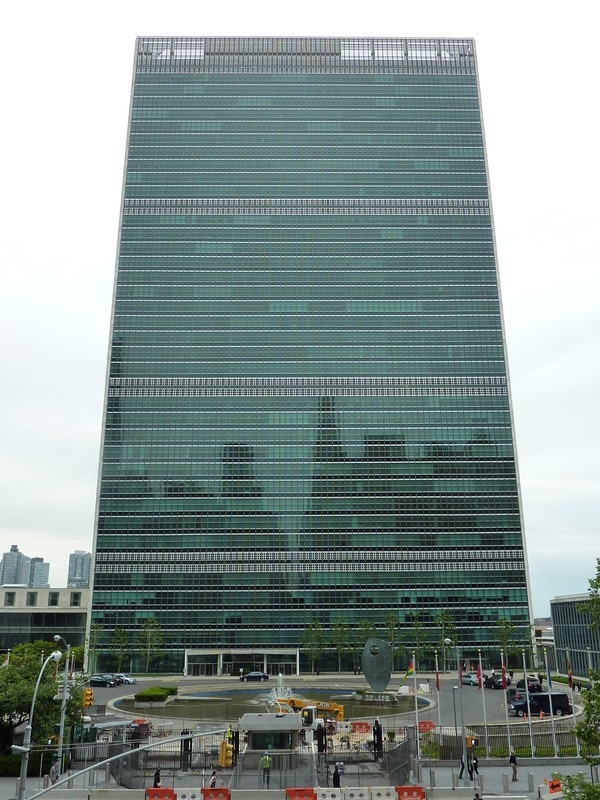 Every morning, I took the 7 to Grand Central Station, walked down 42nd Street, crossing 2nd Avenue – also known as Yitzak Rabin Way, and then on towards 1st Avenue, where the Headquarters of the United Nations rise up along the edge of the East River. I slowed my pace through Ralph Bunche Park, which is mostly concrete, but the small fenced-in area of plants and flowers attracted a couple of American Robins, who were busy hunting for breakfast. I spent my time between 42nd and 47th Avenue – the location of Dag Hammarskjold Plaza – walking past security guards outside the US Department of State and Foreign Missions, and the House of Uganda, feeling very much at the center of the universe with all the languages being spoken around me. I’m sure I was noticed with amusement by a few, I was the only lady with UN blue hair! Dashing diplomats, at the entrance of the UN. 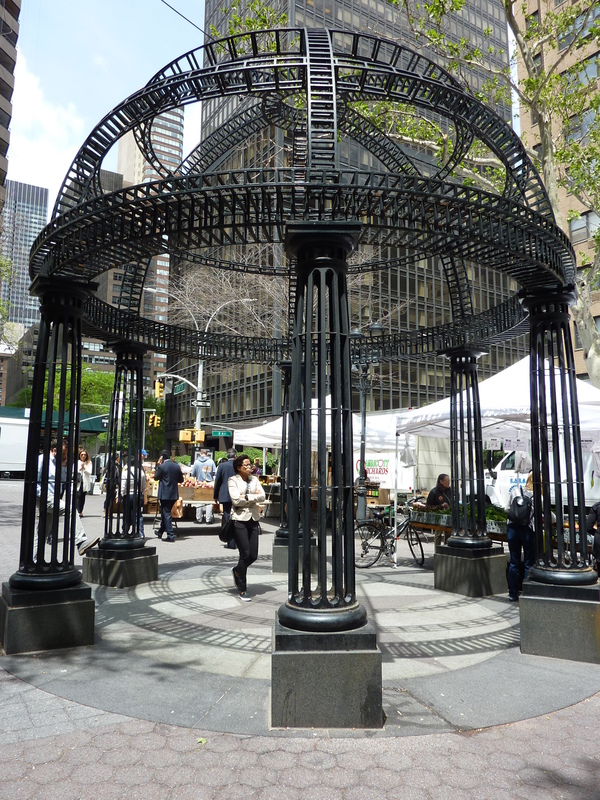 Taking a rest in Dag Hammarskjold Plaza. 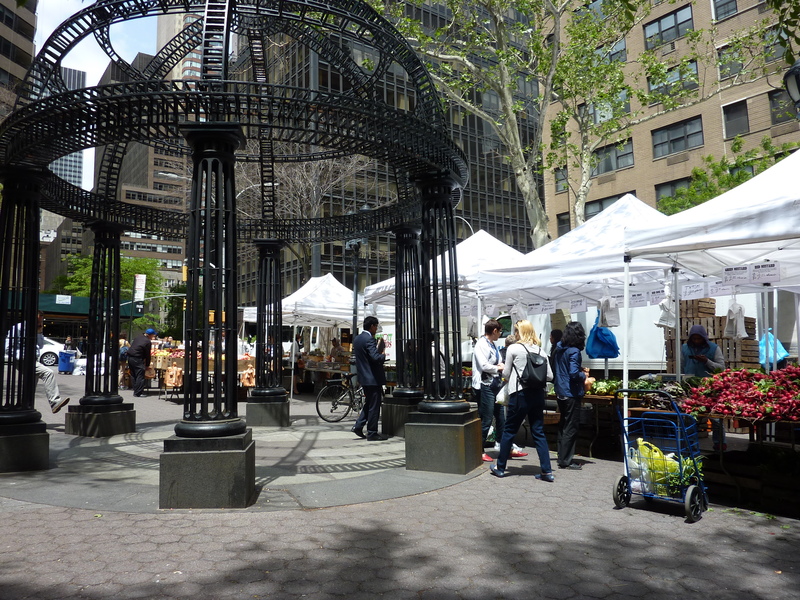 There was a farmer’s market my first day at DH Plaza. Fun public art – the giant Hello Kitty Time After Time Capsule, designed by Japanese artist Sebastian Masuda. 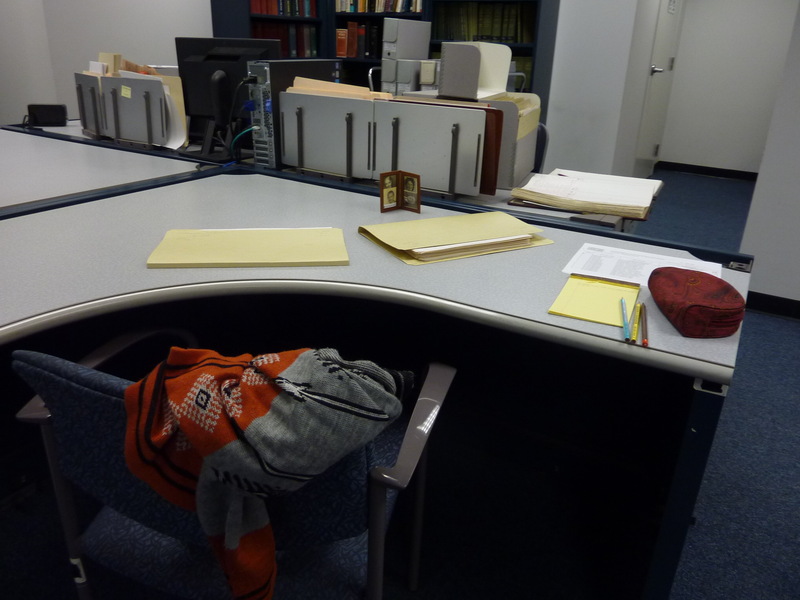 Of course, since it was my first visit to an archive, I requested too much, and had to narrow down and prioritize quickly what I wanted to look at after the first day. To me, it was all very interesting, but I would have needed to spend a month in there, 8 hours a day, just to see everything I requested, and I had only three days! The hard work was a pleasure, but it gave me an appetite. Fortunately, there were plenty of great choices for lunch in the neighborhood. 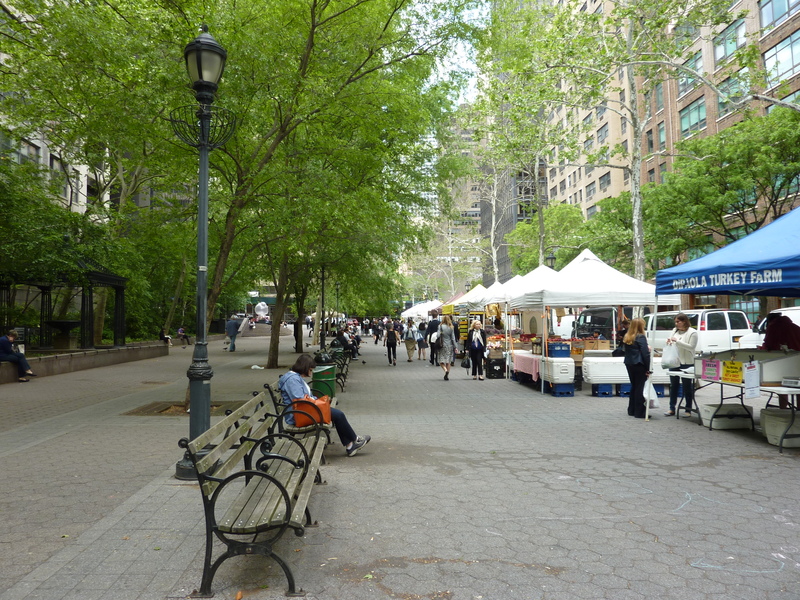 One day, I had a Maine lobster roll from a food truck across the street from UN Headquarters, and if I hadn’t been so eager to get back to the work, I would have tried out the Nigerian food truck on the next block, too. 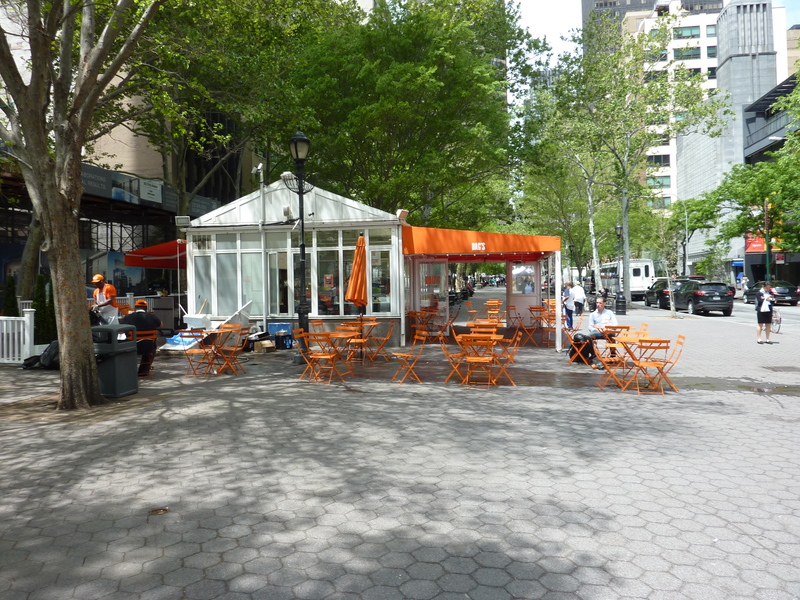 Also had a nice lunch here – a “Dag Burger with Cheese” at Dag’s Patio Cafe in DH Plaza. 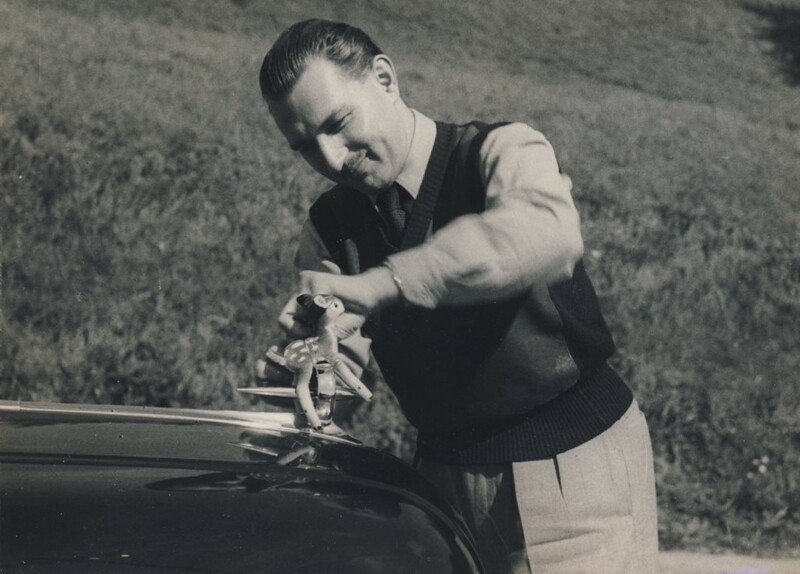 By the end of my visit, I came to appreciate that it is the personal letters of these people that interest me the most, and how lucky I am to have so much of Vlado’s correspondence. I went to the archives out of curiosity, with no expectations, but with hope that I would find something special, something that other eyes had missed. And I was rewarded for my efforts – with a love letter written to Dag. The writer is very forward in her intentions, and though it embarrasses me to admit it, I couldn’t help but see a bit of myself in her admiration for his character, her wish to do something good because of him. I can’t deny the romantic tone of my writing, that I fell in love with both Vlado and Dag in the course of my research, and that love for them gave me the courage to write some of the things I did, so I feel this letter was meant to be found by me. The last page, with her signature, will be transcribed, to protect her identity. 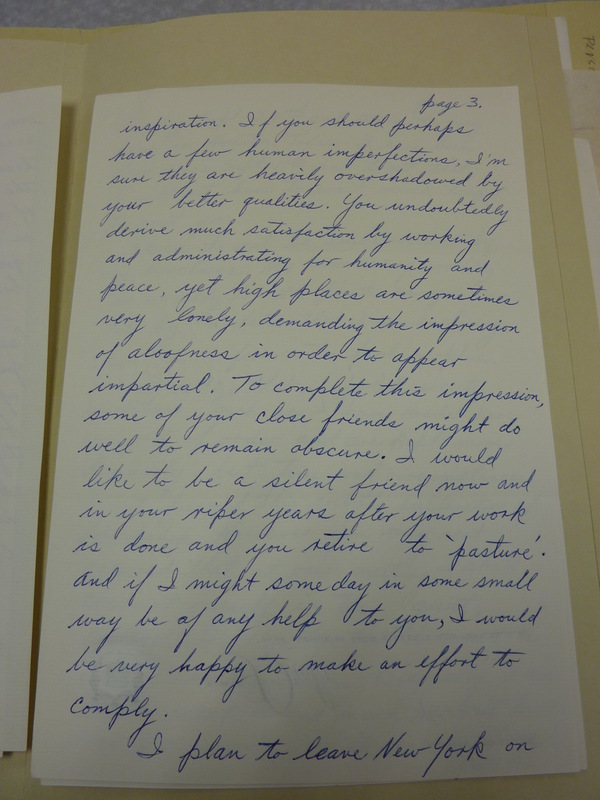 From the same file, I’m also including transcriptions of a letter of introduction from the Ambassador to Spain Jose Felix de Lequerica, and a small note from the Secretary-General’s private secretary, Miss Aase Alm, which came before he received her letter. From the United Nations Archives in New York, S-0846-0004-08, Operational Records of Secretary-General Dag Hammarskjold, 1953-1961. I have received today a letter from His Eminence Cardinal Spellman, introducing Miss ——, from Houston, Texas, and asking me to receive her. During the course of the conversation Miss —— told me that she wishes to present her compliments to Mr. Hammarskjold and speak to him about a personal matter. I have called her attention about the difficulty of such an interview, as I personally cannot arrange for this meeting not knowing myself the nature of same. But in the view of the interest shown by Cardinal Spellman, I am giving this letter of introduction to Miss —— in the event that during your conversation with her you may be able to find something of interest to the Secretary-General and, at the same time, comply with the wishes of Miss ——. I chose to meet you through the Spanish Ambassador because I thought that Spain’s more or less neutral position would eliminate any political implications. 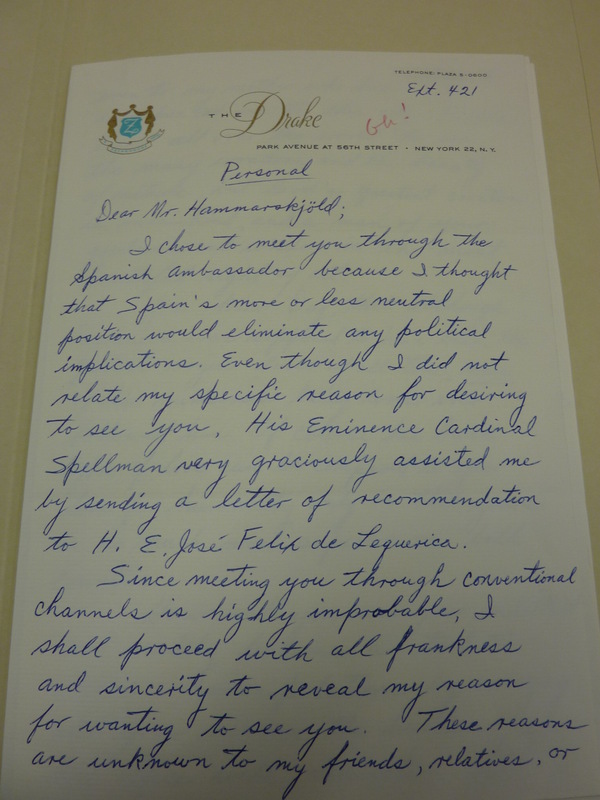 Even though I did not relate my specific reason for desiring to see you, His Eminence Cardinal Spellman very graciously assisted me by sending a letter of recommendation to H.E. Jose Felix de Lequerica. Since meeting you through conventional channels is highly improbable, I shall proceed with all frankness and sincerity to reveal my reason for wanting to see you. These reasons are unknown to my friends, relatives, or even to my mother who has accompanied me to this city. People travel all over the world to see the many wonders and the beauty of nature, but God’s greatest creation is mankind, and a man of your goodness and wisdom is the most beautiful sight of all. You know Dag, that although Cassanova was supposed to have been the greatest rogue lover of all time, none of his numerous lady loves ever followed him. Of course his base type of love can be compared to your love for humanity only in that yours is so much more superior on both counts. How well you use your intellect and readily become a tool to God’s manipulations by carrying out your mission, the burden of your high office with dedication and inspiration. If you should perhaps have a few human imperfections, I’m sure they are heavily overshadowed by your better qualities. You undoubtedly derive much satisfaction by working and administrating for humanity and peace, yet high places are sometimes very lonely, demanding the impression of aloofness in order to appear impartial. To complete this impression, some of your close friends might do well to remain obscure. I would like to be a silent friend now and in your riper years after your work is done and you retire to ‘pasture’. And if I might someday in some small way be of any help to you, I would be very happy to make an effort to comply. I plan to leave New York on Tuesday September 22nd and return to my home in Houston, Texas. I have been here since September 11th and trust that I will not have to wait much longer to meet you. Please do not be embarrassed by my directness. My manner of writing is usually to the point as you can tell by a letter that I am enclosing here in reference to food surplus. I realize that in polite society revelations such as I have made here are out of order and are kept more demurely, but time and circumstances do not permit this subtle cultivation of friendship. However, you may rest assured that at our meeting I shall conduct myself in the quiet, controlled dignity that becomes a respectable woman. Personally, I am much meeker and much more at loss for words. This entry was posted in Dag Hammarskjold, Uncategorized, United Nations, Vladimir "Vlado" Fabry and tagged 1953-1961, Aase Alm, Ambassador to Spain, Cardinal Spellman, Dag Hammarskjold, Dag Hammarskjold Plaza, Independent research, Jose Felix de Lequerica, Love letter to Dag Hammarskjold, Love Letters, New York, Operational Records of Secretary-General Dag Hammarskjold, Ralph Bunche Park, red pencil, S-0846, S-0846-0004-08, Susan Williams, The Drake Hotel, UNARMS, United Nations, United Nations Archives and Records Management, Vladimir Fabry, Vlado Fabry on May 29, 2015 by fabryhistory. I’m kind of confused though, which box was it in? how did you wind up with that box? Thanks for your questions. I just decided to look at the Fonds of the Secretary-General on the UN Archives website, chose the Operational Records of Dag Hammarskjold – S-0846. To break it down, it was in Series Operational Records -S-0846, which had only 4 boxes, so I looked at them all. It was in box 4, file number 8. First series, then box number, then file number: S-0846-0004-08. It was just curiosity and luck that led me to that box, I had no clue what I would find. Dear Noel, I’m glad I could share this with you! Thanks, John! 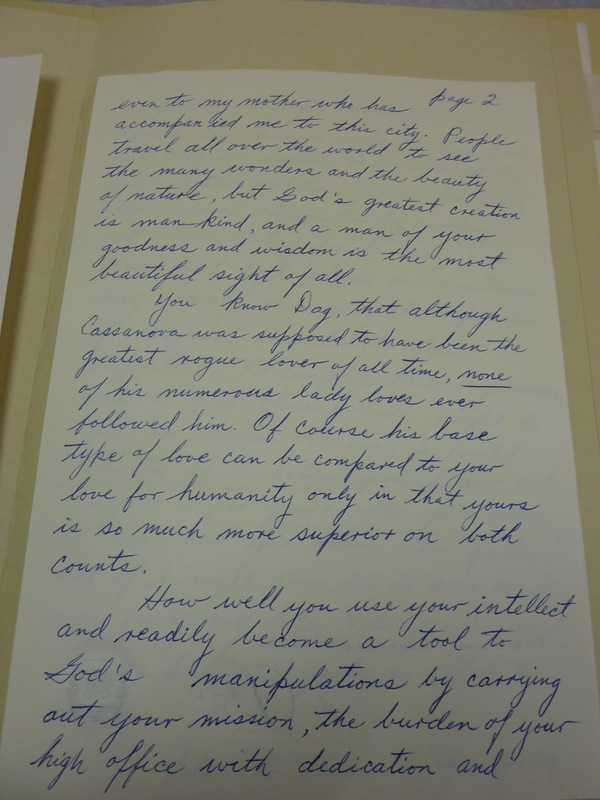 As far as I know, this is the only love letter written to Dag – so glad that he saved it.